You’ve seen them in action. 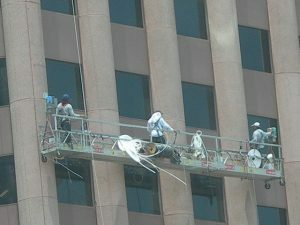 The brave souls who go to great heights for high-rise window cleaning in Cleveland, OH. These large buildings require the right crew, with the right experience and the right equipment. What exactly do window washers need to get this job done? If you own a building that requires big-job window cleaning equipment, here’s a quick overview of what you or your crew will need. Abseil window cleaning is often the only possibility for cleaning many modern buildings. You’ll need the expertise of a trained abseiler and the proper safety equipment. A complete set of ropes, harnesses, anchors, connectors, ascenders, descenders and more is needed for this potentially risky job. You’ll also need time. These types of jobs are typically very time-consuming. Some buildings are so large that, once the last pane is washed, it’s nearly time to start the first one again. Window cleaners in Cleveland, OH use a variety of scaffolding types. For large buildings, suspended scaffolding is often required. Like abseiling, this requires extreme safety measures and in-depth knowledge of the techniques involved. From one-person platforms, to swing stages, to building-wide systems, there are many options from which to choose. Window cleaning experts will determine what scaffolding should be used for your window cleaning job in Cleveland, OH. In some situations, abseiling down to a window isn’t necessary. Window cleaners can be hoisted up to clean the hard-to-reach surface. Cherry pickers are often used to reach awkward spaces. It removes the need to stand on a structure of the building and helps reach windows that might otherwise be neglected. The drawback is that it requires somewhere to park. This can be a challenge in some busy parts of the city. For this reason, it may be difficult to get close enough to the window to use a cherry picker for window cleaning in Cleveland, OH. When working on the ground, water fed poles offer a great option to safely reach windows overhead. These poles can reach over 70 feet and have their own built-in water supply. It’s a simple solution, if your building is small enough to not require more intensive equipment, such as scaffolding or abseiling gear. This method allows window cleaners to work with a minimum mess, as detergent is not used. Since they don’t deposit large amounts of detergent into drains as it washes away, it’s also environmentally friendly. The most important equipment for window cleaning in Cleveland, OH is the right crew. 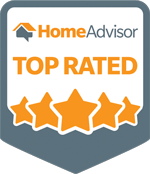 The experts at Central Window Cleaning are equipped with the knowledge, tools and experience to get high-rise jobs done right. Trust your panes to these professionals, for impeccable results.